Now that I'm sure that my EBBP2 partner, Farid, has received my box I guess I can blog about the chutney I made. I was scrambling to find something to make to for Farid since Andrew said the theme was 'something fruity'. I didn't want to make another cookie, fortunately I found this recipe from the September 2004 issue of the BBC Good Food Magazine. 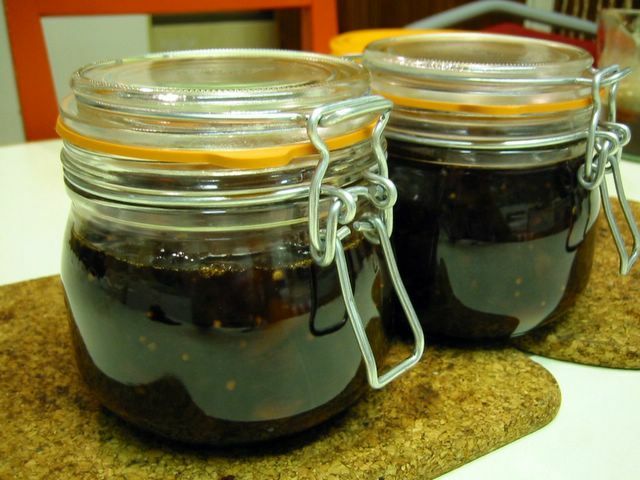 This chutney was great and so appropriate since it uses mostly in-season autumn fruits. I was naturally apprehensive since I've never made chutney before nor sterilise jars. I was meant to leave it to simmer for a long period but I couldn't help peeking and stirring it afraid that my very first chutney will burn. After more than an hour, finally the mixture started to really thicken and jell and I'm ready to load it in sterilised jars. Mind you, I tasted the chutney and it was so soury-sweet-slightly spicy good! Actually the taste reminds me of my favourite champoy (Chinese fruit preserve). Hehehe. Days before I went out looking for preserving jars in cookshops. The smallest I can find are these half-a-liter capacity ones. I was thinking they're kinda big but since I didn't have any other alternative I bought them. So with that done, time to find out how to sterilise. I didn't know there were several ways of doing these and decided to follow Delia Smith's How to Cook that says to put the jars in a 350F/180C preheated oven for *at least* 10 minutes. The rubber seal was not included of course otherwise it will cook in the heat. So I washed and cleaned and dried the jars then baked them and separately scalded the rubber seals with very hot water. As soon as I took out the jars from the oven I poured in the chutney. It was actually sizzling as I did it, then quickly put a waxed paper disc on top (the book said this is to prevent mold from forming). The hardest part for me is fitting the not-so-elastic hot rubber seal onto the very hot glass lid. This is necessary coz it has to be sealed while everything is still hot. So there - I've got my very first chutney preserve. Time will tell if my sterilising and sealing were any good. Both Delia and the magazine recommended that chutneys be consumed at least 3 months from the time it was made to allow the flavours to mature. Well, it's already 1 month and I'm definitely counting 'til I can slather it on cheese, roasts or cold cuts. Put all the fruits in a wide-mouthed pan. Add in sugar, vinegar, onions, ginger, garlic, mustard seeds, coriander, crushed chillies and salt, then drop the cinnamon stick on top. Heat the pan slowly for about 20 mins, while occasionally stirring, until the sugar has dissolved. Let it simmer at a steady pace without the cover. Stir occasionally until reduced and thickened but still with a nice balance of syrupy juice. This will take about 1 hour and 30 mins. Don't cook it until all the liquid has gone, as it will thicken once it cools. Using a heatproof jug or funnel, pour the chutney while still hot into sterilised jars. It will keep for about a year in a cool, dry place. Filipinos has got this great snacking culture. Our foodcentric way of life can be gleaned from the numerous times we eat in a day. In between main meals we have the proper snacks or merienda then besides these, we constantly munch on little snacks such peanuts, watermelon seeds, crispy fried corn kernels, etc. It's no wonder that there is a great proliferation of street sides snacks up and down the country. And I loved a great deal of them. From the bualaw (binatog), adobong mani, kornik, inihaw na mais, sago gulaman, to the heavier kakanin of puto, kutchinta, suman, etc. or even goto, and pancit. I was often dissuaded by my mother from buying street side snacks because of unsanitary conditions of some vendors. Often, I sneakily buy bola-bola or fishballs dipped in that spicy semi-thick sauce. Yum! It's alright with them if I buy banana cues or valencia (turons). I think their main concern with the bola-bola is that all the customers dip in the same sauce. It can be unhealty but so far (touch wood) I haven't gone down with anything with all the copious amount I've eaten. But the one thing I simply cannot resist at the first whiff of the smoky grilling meat is pork barbecue. 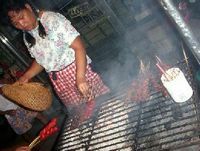 The thought of sinking my teeth in those slightly charred but juicy tangy-salty-sweet slivers of pork skewered in bamboo sticks with its smoky smell makes my mouth water. Ahhh, how I wish I could have one right now. Mind you, this recipe of mine is still being tweaked. I have not found the right taste equilibrium yet that I am seeking for. So just play around with the proportions according to your taste. Actually, no matter how 'right' my recipe is, it would still not taste the same as the street side ones because you need the dust and fumes from the passing jeepneys and buses, the dirt from the street or even maybe a little sweat from the vendor (yikes) to have that authentic taste. ;) Nyahahaha! A tip in barbecueing is to get a meat cut with some fat in it and arrange the meat a bit packed together in the skewer. These will keep it moist and juicy in the grilling. Do not grill it too well done or it will turn hard and tough. I assume you know how to start a charcoal barbecue, but just in case here it goes - wait until the charcoals have a grey ash coating (about 20-25 minutes after you start the fire) before you begin grilling. 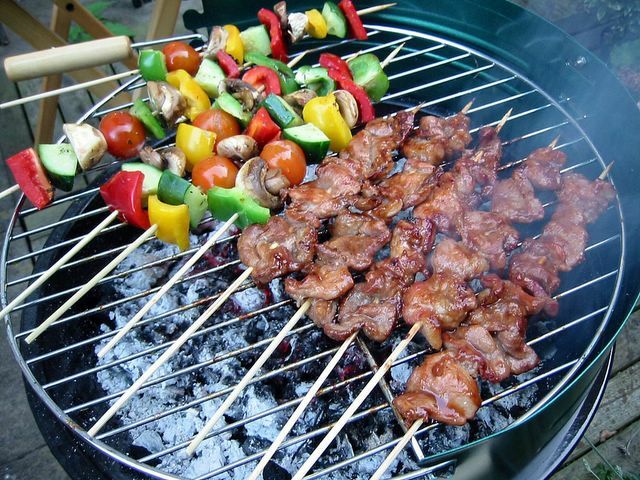 Then if your grill have graduated levels, start at a fairly high level at the beginning then lowering it as the heat dissipates or cools down. The current host of this interesting theme of the 3rd Lasang Pinoy is Kai of Bucaio. The said blogging event were originally started by Karen and Stef as a way of showcasing the Philippine's varied food beyond the ubiquitous adobo, pancit, and lumpia plus to generally have fun in cooking and blogging about Pinoy food. Mix soy sauce and lemon juice; taste it. If need be add more lemon juice or soy sauce to get the right salty-sour balance according to your taste. Add all the other ingredients except the pork. Taste again and adjust seasonings if desired. Marinate pork in this mixture overnight. Soak bamboo sticks in water for about 30 minutes. Skewer pork meat close together in the bamboo sticks. Bring to boil the remainder of the marinade in a saucepan. Set aside as a basting sauce. Grill pork barbecues over hot coals while basting with the reserved sauce. Christine France's recipe in her book Chocolate Dreams caught my eye because it just is different, besides the fact that I haven't made anything like it, and also because I have all the ingredients at home. That made me doubly happy 'coz I don't have to spend anything extra. Well, to tell the truth I was semi-desperate to find a recipe for my filo pastry that's been sitting in my freezer for months. I hate waste and was afraid that it would expire before it can grace our table and stomachs. The size of the baking pan had to be changed to a smaller one since the pastry when rolled and coiled did not fill it up completely. I don't think it was meant to be donut-looking. Or maybe it's because about a quarter of the filo pastry was already soggy hence I couldn't include it. Anyways, it was quite easy to make, rolling the filling in the pastry a doddle, with only the coiling part in the pan making me work carefully 'coz I was afraid the pastry would break. Taste wise it was good at least for me since I love nuts. The texture and pastry reminded me of baklava that got me thinking this must be a variation of that type. But I do love it in a very chocolatey-nutty way. Preheat oven to 180°C/fan 160°C/350°F/gas mark 4. Grease a 20cm (8-inch) round baking pan (springform or loose-bottomed would be better). Mix icing sugar and cinnamon in a bowl. Set aside. Toss the chopped dates in the ground almond making sure to separate the date pieces while doing so. Set aside. Melt chocolate and butter in a heatproof bowl over a pan of simmering water. Stir until well combined. Remove from heat and stir in the icing sugar mixture. Add the ground almond and dates. Mix until well combined. Cool. On a clean surface, layout one of the filo pastry sheets. Brush lightly with melted butter. Put another sheet on top, repeat brushing of melted butter. Divide the chocolate mixture into three. 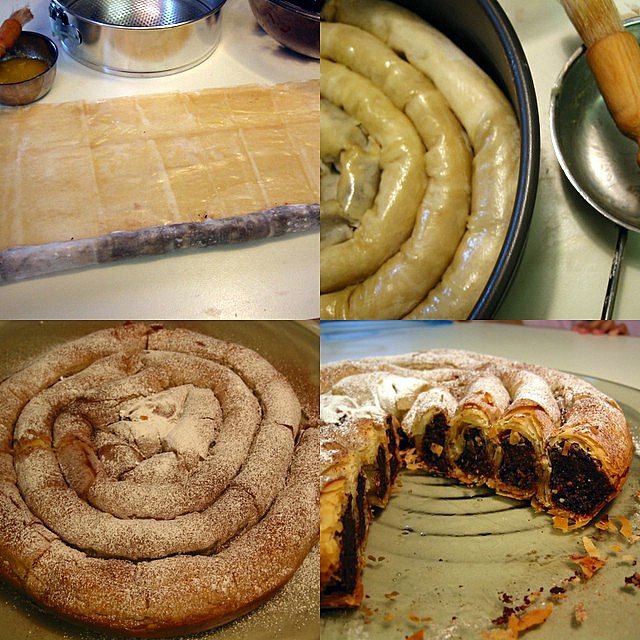 Form one portion into a sausage-like log near the edge of the lower part of the long side of the pastry sheets. Roll up sheet to cover the chocolate, making sure to keep it even, all the way to the end. Coil this inside the round baking pan. Repeat with the other sheets until you have filled it all up. Finally, brush top of coiled pastry with melted butter. Bake in oven for about 30-35 minutes. Remove from heat, cool a little then remove from pan. Cool completely. Before serving, sift or sprinkle a little cocoa, cinnamon, and icing sugar on top. Got a lovely surprise last week when I received Cindy's box from Montpellier, France as part of the EBBP2 blogging event. 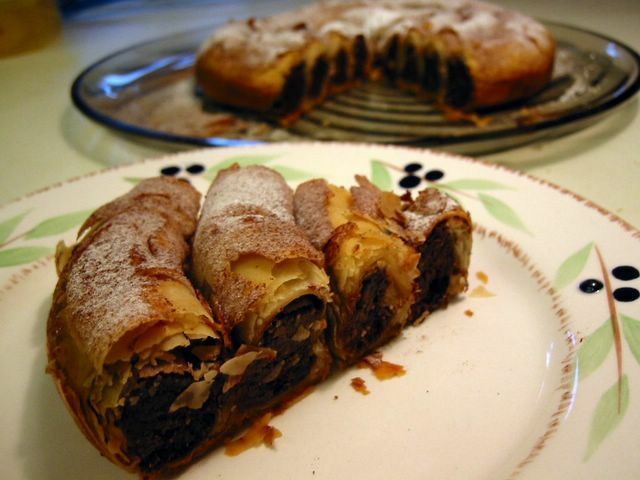 The lady is an avid cook and baker as can be seen in her blog called Cindy's Kitchen. It's just a shame coz I can't read nor speak French so like other non-English blogs I visit, I'll have to make do with admiring her pictures. Preheat oven to 350F/180C/fan 160C/gas mark 4. Grease generously 24-cup mini muffin pan (I used one with 1 3/4-inch diameter hole). Cream butter and sugar for about 3 minutes using an electric mixer. Add in egg yolk, mixing well. Stir in the flour (with wooden spoon if preferred) until smooth and well combined. Form into a log of about 14-inches in length. Wrap in plastic and chill in the fridge for about 30-40 minutes. Cream butter and sugar using an electric mixer for about 3 minutes or until light and fluffy. Mix in the grated almond paste (a stick blender is good to use at this point). Stir in the flour, combine well. Cut the dough into 24 each sized discs and divide among the mini muffin pans. 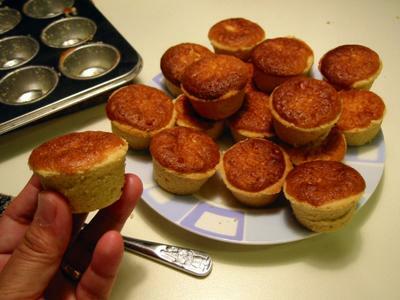 Fit the dough evenly in the muffin holes by using the end of a dowel rolling pin or by using your thumb. Spoon the filling into the pastry-lined muffin pans up to almost the brim. Bake in the oven for 20 minutes until golden brown. Remove from oven and cool in the pan for 5 minutes then using a pointy knife, pry each pastry loose and turn out into a wire rack to cool completely. 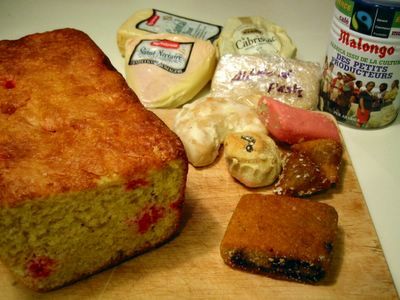 Long were the weeks and months that I lusted after this recipe when I first saw its picture in a food magazine. It looked so pretty and I could just imagine how luscious it would taste. A week ago when I was able to finally make it, I was proven right. Though there are several layers, it's not hard to make. I do have an issue with the baking time which I increased by 5 minutes because the middle is a bit undercooked (not that I mind). The cheesecake layer itself has just the right amount of sweetness and not sour at all. While the biscuit layer gives it a nice crunch. Actually, I think the cliche - the whole is more than the sum of the parts - applies well here. Each layer is good but eaten as a whole, they blend and complement each other so well that I could only rave and rave about it. Even my husband who's not really a dessert fan loved this. I also liked the fact that the toffee sauce is on the side so you can put as little or as much as you like. 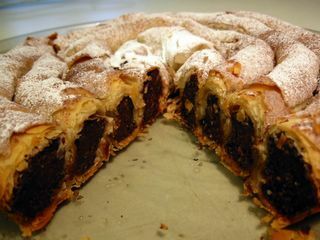 Thanks to Silvana di Franco for this little piece of heaven in a cake tin which I got from the BBC Good Food magazine. 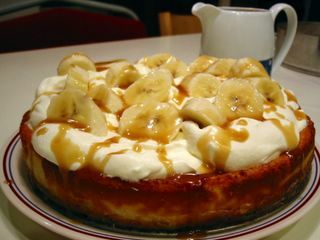 By the way, I though 'Banoffee' was the name of some exotic town in a far flung place like Canada. It turned out it was from banana + toffee = banoffee ! I was laughing so hard when I realised my stupidity. LOL indeed! And it did not come from abroad, it was thought up by a chef in The Hungry Monk pub in Sussex. It is English after all! Mix melted butter with the biscuit crumbs and press the mixture evenly into the bottom of a 23cm (9-inch) springform pan (preferably non-stick). Beat all the ingredients in a bowl with an electric mixer until well combined. Pour into the cake pan set on a baking sheet making sure to level off the top. Bake for 50 minutes until golden brown. The top will be a little wobbly but it will set as it cools. Turn the oven off and leave the oven door open leaving the cheesecake to cool completely inside. Melt the butter gently with the double cream and sugar in a saucepan while continously stirring until the sugar dissolves. Let it gently boil briefly. Cool completely. Whip the whipping cream to soft peaks. Squeeze some lemon juice onto the sliced bananas. Put the whipped cream on the cooled cheesecake in a swirling fashion. Wedge the banana slices in the cream. Drizzle a little toffee sauce on top and also serve on the side. This was meant to be for the last IMBB 19 - all about vegan food. As usual, something got in the way and I was not able to post on time. But anyway, this is quite good and not far off from your usual stir fry. The only thing I don't like in it is the bamboo shoots. I've never been fond of its stinky nature so I ladled it mostly to my husband while I picked most of the bok choi and mushrooms. ;) It looks a bit dry 'coz all the sauces are at the bottom of the bowl. I should have used a shallower and wider plate just to show the sauce in all its glory. Hehe! Oh yeah, this is adapted from the cookbook Chinese Cuisine by Huang Su-Huei. If using dried mushrooms, soak the mushrooms in hot water for about 30 minutes until soft. Drain and squeeze out water from them. Cut off the stems and discard. Slice into bite-sized pieces. Set aside. 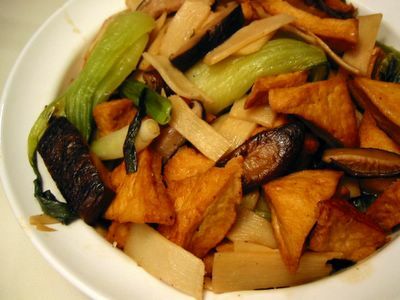 Pat tofu pieces dry and deep fry or pan fry until golden brown. Remove and drain, set aside. Mix stock, soy sauce, black pepper, and sesame oil in a bowl. Set aside. Mix cornstarch and water in a separate container. Set aside. Heat a wok with about 2 Tbsp oil. Saute ginger and green onion until fragrant. Add mushrooms and bamboo shoots. Stir to mix. Add stock mixture and bean curd. Bring to boil and cook for 3 minutes. Stir in bok choi and cook for 2 more minutes or until the liquid is reduced to half. Mix in the cornstarch mixture to thicken sauce. Dish up and serve. 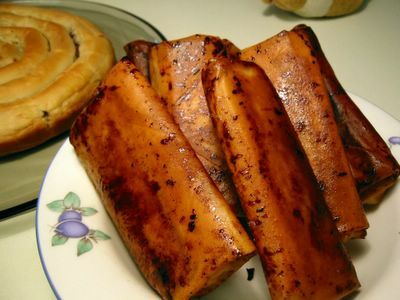 The streetside snack food of bananas sprinkled with sugar enveloped in springroll wrappers is commonly known in the Tagalog region as 'turon'. However, in our corner of Cavite this is always called as 'valencia' or 'balensia'. Biiii-li na kayong balensia !! shouts the girl in a sing-song manner with a bilao full of these wonderful snacks on top of her head. Like anything else, I've got no idea why it's called that. But it may have something to do with the way the contents are rolled and wrapped in something because I know of a sewing stitch or seam wherein the frayed/raw edge is enclosed by inverting the sewed edge itself then sewing over it again. My mother always called that a 'valenciana'. So I think the term pertains to a manner of enclosing something resulting in a 'rolled' appearance. Anyway, this is very easy peasy to do and as usual I nearly burned it. :( You know how they say cooking is all about timing. It seems whenever I cook this I always forget that this is not a very forgiving frying piece. Since it's got sugar it burns easily. So please remember (more for my kids this one) when you cook this do not put the heat too high or neglect it. Turn it often (if pan frying) or keep a close eye on it. There are lots of variations you can do, some even put in chocolates! I used muscovado sugar on this since it is the closest to our panucha. I love the caramelly glaze it imparts to the valencia. Also I added slivers of langka (jackfruit) because it gives that fruity aroma and adds sweetness to the package. As for the banana, I still haven't found any other cooking variety of banana closest to the saba other then plantain. In my opinion, saba is still the best in terms of flavour and texture but for now plantain will do. The way I wrap it is like in a parcel, similar to the way springrolls are done. But you may just roll it like a log and leave the ends open. This way the wrapper becomes extra crispy with more drips of sugar glaze. Peel and cut bananas into about 3-4 inch lengths then into quarters lengthwise. Roll bananas in the sugar. Arrange bananas and langka in springroll wrappers and wrap as in a parcel (or wrap like a log with both ends open). Deep fry or pan fry in oil keeping close watch as this burns easily. Drain on a wire mesh strainer (not on paper towels because they will stick to the valencia). When I saw the picture of this in Gordon Ramsay's Kitchen Heaven, I thought - 'I definitely gotta do this'. Well, mine did not exactly look like the picture in the book :lol: but it was good nonetheless - in an unsophisticated way. As far as I know, the 'daube' is a rustic Provencale stew made of very slowly braised beef with wine, vegetables and spices. Ramsay's use of squids plainly piqued my interest besides the fact that I love squids (also called 'choko' in my hometown). I saw a bag of squid tentacles at our local Chinese grocery (I prefer them from the body) and proceeded to make this dish. As I was cooking, I saw the close similarity with our mechado. Except for the wine, it had almost the same ingredients and preparations. Put the squid in a bowl with the wine, lemon slices (squeeze a little), bay leaves, parsley, garlic, and season well with salt and pepper. Leave to marinate for 2 hours. In a pot, saute the onion in hot olive oil until soft. Drain the squid (reserve the marinade) and add to the onion. Cook for about 2 minutes. Discard the lemons and add the marinade to the squid. Cover the pot and simmer gently for 2 hours. Add in the potatoes and cook for a further 15 minutes or until potatoes are cooked. Last week, I had the great privilege of meeting a Filipina food blogger based in the US. Purplegirl was on a flying to visit to London on her way to the Middleast for a holiday. We grabbed the chance to meet up, chat, and of course eat! What else would food bloggers do? ;) She was so kind and generous to give me a Jalapeno bread which she recently raved about in her blog so naturally I was very curious. I opened it first thing when I got home and the great aroma that hit me was that buttery-cheesy smell spiked with the spiciness of jalapeno chunks dotting each slice. Me and my husband had a great time eating it with our soup. We toasted it and mmmmmm! it was even more aromatic and tasty. 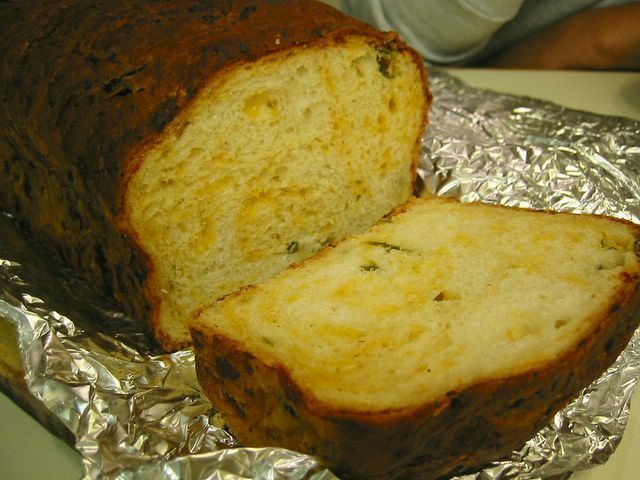 Love that bread - I gotta hunt down a copycat recipe in the hope that maybe I could recreate even a fraction of it. Getting back to my meeting with Purplegirl, we walked a few yards from Victoria station to a traditional Thai restaurant recommended by Lady Charlie, called Mango Tree. Now, I'm not a restaurant reviewer so I'll just try the best way I can to describe the experience. The place looks smart, neat and well appointed, good high ceilings with recessed lightings, modern furnishings all in the earthy color scheme of different shades of brown. I liked it immediately since I prefer an uncluttered, neat and airy ambiance in a restaurant. Loved the little Thai touches like the big dried chilli tucked in the napkin holder, small mango trees in pots, etc. We ordered largely from the lunch set menu since it has what we wanted. I had Fish Cakes for starters while Purplegirl had the Papaya Salad. Mine was good although I find it had a tad bit more flour (making it more chewy) than I wanted. All I can hear from Purplegirl was 'Mmmm, mmmm' with her head nodding positively approving of her Papaya salad. For mains I had Green Curry Chicken and she had the Prawn Curry. They served it with plain boiled rice and a side salad. I don't know which one we liked better - the side salad or the mains. LOL! The salad was your usual mix of greens but their dressing was so nice. The taste had a very mild taste of patis, lime, and sugar. It was mild and sort of 'unobtrusive' that I feel like it's teasing me to eat more. Maybe next time I'll have a full order of the salad instead of just on the side. About my green curry - it was great with the sauce suitably thick and mildly spiced. Not too spicy not too bland - just right. Purplegirl noted that her Prawn Curry was nicely balanced as well, spiced enough and not too salty unlike what she often gets in other restaurants. Desserts were served with Purplegirl having the Strawberry Pandan Cheesecake(?) and me with Cheesecake Malakor. The latter had papaya and passion fruit mixed in it on a peanut crumble base. It was good although I find it a bit too sour for me. 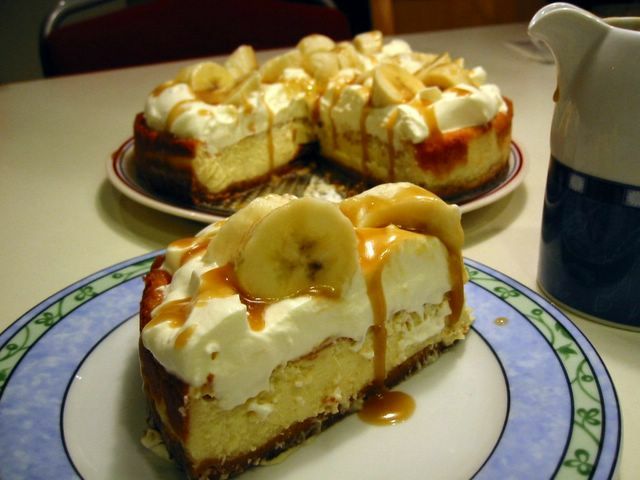 I prefer sweet creamy cheesecake that's why I'm not too keen on most American cheesecakes. As for hers, she said it was good as well albeit the taste of the pandan was not so forthcoming. She was expecting a stronger taste and so was I. As a whole, we thoroughly enjoyed our meals and at least I myself would come back to explore more of their menu. We were fortunate to be there just before 12 noon so we practically had the place to ourselves and able to order before the kitchen got busy. Believe me the place was packed by the time we left at past 1 PM. That's no great wonder with the kind of service and good food on offer. Thanks Purplegirl for the delish loaf of Jalapeno bread and that great lunch we had. :) 'Hope to see you again so we can raid another restaurant! ChicaJo of 80 Breakfasts gave us her very well presented Binakol. She also regaled us with memories of her beloved lola who loves that tinola with a twist. Annabanana in the same named blog, revealed her uncontested position as a her family's burping champion in their sopas ang guinataan foodfest during storms. Though I doubt if she still does the same in Korea where she currently resides which made her contribute the storm comfort food of that land with the spicy looking dishes of Nokdu Bindaeteok, Buchimgae, Pajeon. Kai of Bucaio have Fried Tuyo and Sardines Omelette, besides extolling the vitues of tuyong dilis and fried eggs in the yearly flooding of Pangasinan. Father RV, Kai's Jesuit priest friend (now in Mobile, Lousiana) who did not let the twin disasters of hurricanes Katrina and Rita deter him to blog about being comforted by Champorado, Ginatan, and Palitaw during his boyhood experiences of typhoons in the Phillipines. Lou of Chickpeace adores Ginisang Munggo whether housebound by typhoons in Hong Kong or in the floods of her native Malolos, Bulacan. Iska's Pritong Tilapia and Talong con Kamatis and Bagoong over at Iska's Recipes (based in Beijing) is great eaten with your bare hands during a windy and chilly stormy day. Mike of LaFang in Brunei, made up for lost time in not making it to Lasang Pinoy 1 by giving us two entries - Ginisang Monggo and Spicy Sardinas Guisado. His pictures and reminiscing of storms in his native Santiago, Isabela really sent me down memory lane. MarketMan of Market Manila, recalled the aftermath of one of the most destructive typhoons to hit the Philippines - Typhoon Yoling, and in the course, re-learned how to make the delicious Sinigang sa Bayabas. One of our first time contributors, Mira of Mirsbin, shared with us her recipe of one of her 'cold bed' comfort food, Shanghai Fried Rice. The Panda at Pan de Panda, have Daing na Bangus to do the trick of comforting her during wind-howlingly stormy days. Sassy of Pinoy Cook, recalled her superstitious lola and how she introduced her to the virtues of Salabat. Her grandma, their house, and the storms also made her remember Egg Pie, which was regularly bought by her aunt as an afternoon treat. 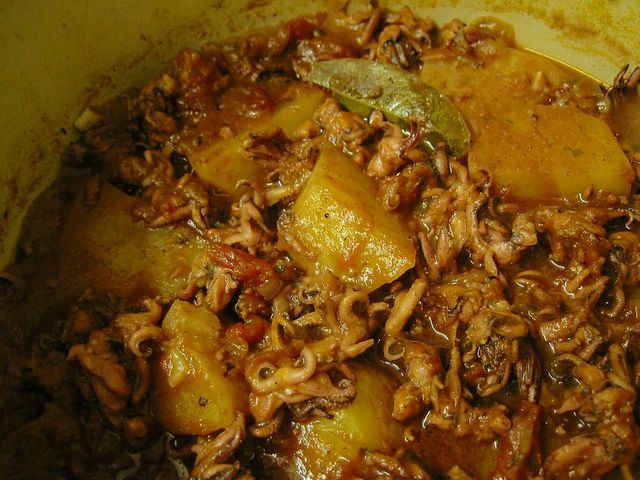 Karen of Pilgrim's Pots and Pans shared not only her childhood food memories during storms but also the recipe of the meticulously spiced (undoubtedly delectable) Albus Itu. 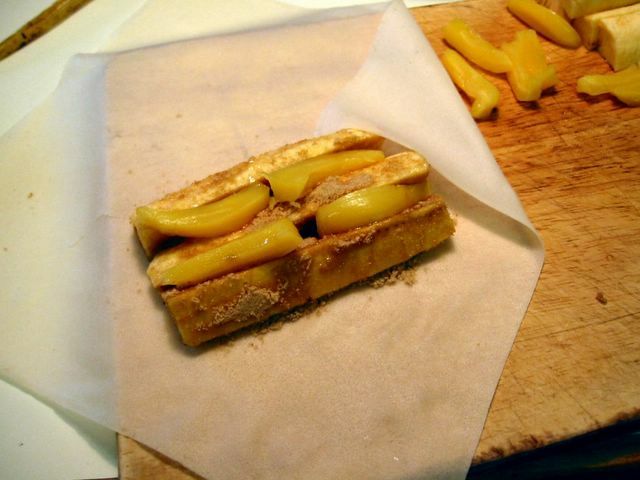 Manny, Karen's blogging guest, has an example of turning his childhood typhoon food memories to a business potential. 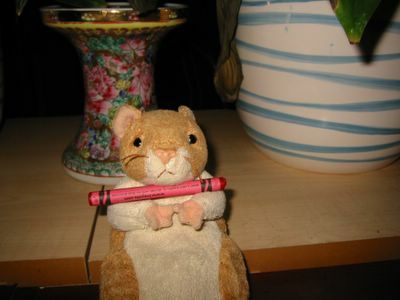 He shared with us his recipe for the yummy gnocci-looking Gulgoria. Lani of Worthless Anik-Anik loves one abundant food during rainy season - Talangka. As a serious talangka connoiseur, she also have a tip on what to have as afters. Organa Monster of Ang Sarap loves her aunt's Goto so much that several disastrous attempts did not discourage her from trying again and again 'til finally perfecting it. Stel aka Babyrambutan recalled how Typhoon Yoling pried open their roof like a sardine can and soaked them all wet. Fittingly, her entry of Crab and Corn Soup, is all to do with memories of eating canned food during that big bad storm. Stef blogging at Beyond Adobo drew our attention to an aptly named Typhoon restaurant in Santa Monica, California, serving what else but Pinoy food! Jmom residing In Our Kitchen, is one of our participants who can't help but cook more than one for our theme. I say give me Meat Ball Soup and Ligo Sardines Sauteed with Bok Choy anytime. Phisch over at In That Number, was one of the earliest contributors in this blogging event. She toasted some rice, ground it, mixed with some water, some sugar and voila you have Rice Coffee! Stef again in her main blog Stefoodie, relived songs and memories when she was still living in the Philippines and trying to brave the rains. Like most of us, her canned food supply during storms put her in good stead to give us Ginisang Sardinas at Misua. Ting food blogging World Class Cuisine, recalled her growing up years in her beloved Baguio and how her mother's smart thinking of using what's in season inspired her to do Daing na Bangus and Tuyo. Celia [das me! ehem ;)] of English Patis, as an alternative to boiling root crops, decided to grate and steam cassava just like her grandma does to do Kalangkang. Thess across the channel blogging at Eetsmakelijk, shared her unfortunate story of nearly drowning in flood waters! Luckily she's still with us to make my favourite Nilupak. And that folks, concludes our Lasang Pinoy 2 weather report. 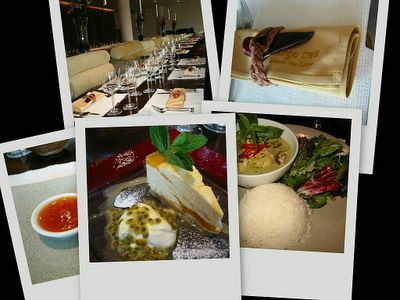 Please visit the blogs mentioned above and take inspiration from the food they're offering. If you think I missed any entry please do bring it to my attention.